All the routes leading to Ghanta Ghar at Lal Chowk, old city and Bhat’s village have been blocked. 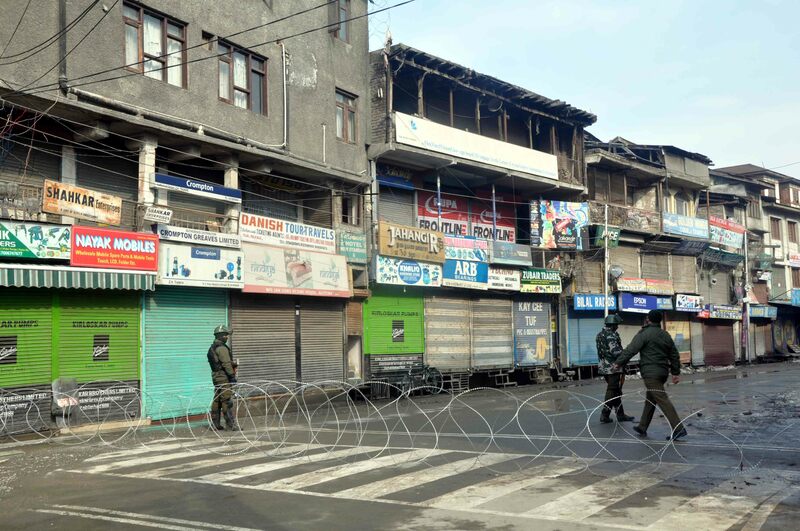 Srinagar: Parts of Kashmir become deserted every year on February 11, as the day marks hanging of Muhammad Maqbool Bhat, the founder of Jammu and Kashmir Liberation Front (JKLF). People in Kashmir observe a complete shutdown and strike on this day. Authorities, every year, impose a curfew and Section 144 (which bars assembly of four or more persons at a particular place) in the old city, Downtown and other parts of valley to stop protests. This year as well, all the routes leading to the Ghanta Ghar at Lal Chowk, old city and Bhat’s village have been blocked. Heavy deployment of forces has been arranged. All the shops and other business establishments are closed in the valley, and traffic is off the roads. On Sunday evening, people including family members and relatives of Maqbool, took out a candlelight march, led by Bhat’s sister Mehmooda Begum from their house to the main market in Trehgam. Maqbool aka Baba-e-Qoum was born in a middle-class family on February 18, 1938 in Trehgam, Kupwara district. His family was known in the village as one of the few educated families. His father, Ghulam Qadir Bhat, who was a tailor by profession, insisted on investing in Maqbool’s education. After finishing his matriculation from Trehgam High School, Maqbool was sent to Saint Joseph College Baramulla for pursuing further education. While speaking to one of Bhat’s cousins, S* (identity protected), Newsclick learnt that Maqbool was an avid reader of literature, and was famous in college for delivering motivational speeches which were politically and philosophically “rich”. During his college years, he started participating in rallies, and delivering speeches condemning the atrocities in Kashmir, said S.
With the passage of time, Bhat garnered following in Kashmir, and became known for his rebellious attitude. He had formed the militant organisation National Liberation Front (NLF). Bhat acquired a masters degree in Urdu Literature from Peshawar University, and continued his studies, finishing masters in English literature and law as well. In Pakistan, Maqbool and his companions were purportedly praised in the beginning. But following his promulgation of the idea of independent Kashmir, he faced a great deal of criticism there. Meanwhile, Maqbool was awarded the death sentence on charges of the murder of a CID officer in 1966. He was arrested by the Border Security Forces (BSF) and police in 1966, after he had returned from Pakistan. During the arrest, a few of his companions were killed in an ambush led by the armed forces. Amanullah Khan, who managed to break the cordon, took asylum in Pakistan-administrated Kashmir, until his death in 2016. He was one of the founders of JKLF. In 1977, Bhat had filed a mercy petition, which was rejected by the Supreme Court of India. On February 11, 1984, Maqbool, who had been shifted to ward number 1 a few days back, was woken by the jailor at around 5:30 am. As per S, he was allowed to pray and read the Quran. At around 7:30 am, he was taken to a courtyard namely Phansi Kothi, and noose was tied around his neck. Maqbool was hanged till death. S further said that his octogenarian mother Shahmali came to know about his scheduled hanging via news which was broadcast on radio a day before his death. Maqbool’s elder brother Ghulam Nabi Bhat, along with his sister Mehmooda, were leaving to see Maqbool. But both of them were detained at the Srinagar airport while catching a flight to Delhi. Maqbool’s lawyer too was not allowed to meet him ahead of the hanging. Bhat was not the first one to be hanged in Tihar Jail, but became the first one to be buried in jail’s premises. Kashmiri separatist Afzal Guru was second. “They didn’t tell us his last wish, they didn’t give us any of his belongings, they didn’t allow us to meet him for the last time,” claimed S.
Since then people in Kashmir observe a complete shutdown and strike on this day. Authorities every year on 11 February impose curfew and section 144 (which bars assembly of four or more persons at a particular place) in the old city or the downtown and other parts of valley to stop protests. This year too, the situation is the same on 11 February. All the entries leading towards clock tower (Ganta Ghar) at Lal Chowk, old city and Maqbool’s village are blocked. Heavy deployment of forces has been made. A few resistance leaders including Yasin Malik have been arrested a day before. All the shops and other business establishments are closed in the valley and traffic is off the roads. On Sunday evening, people including family members and relatives of Maqbool took out a peaceful candlelight march led by Bhat’s sister Mehmooda Begum from their house to the main market Trehgam.